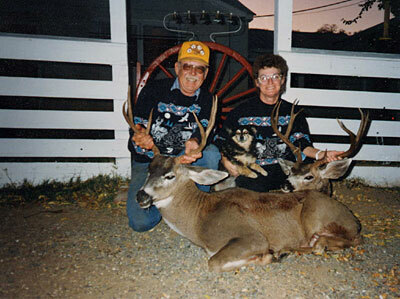 Bill and Kay Burrows show off two nice blacktail bucks taken on their ranch west of Red Bluff, California. Bill is holding a 3x3 and Kay a 4x4. The Burrows Ranch is under California's Ranching for Wildlife program. The Burrows devote a lot of time and energy on habitat management to increase the carrying capacity for deer and other wildlife. Looks like it is working by the picture above.